All are very welcome to join us for the first of this term’s melodrama screening and discussion sessions. This will take place on Monday the 25th of January, 5-7pm, in Jarman 7. 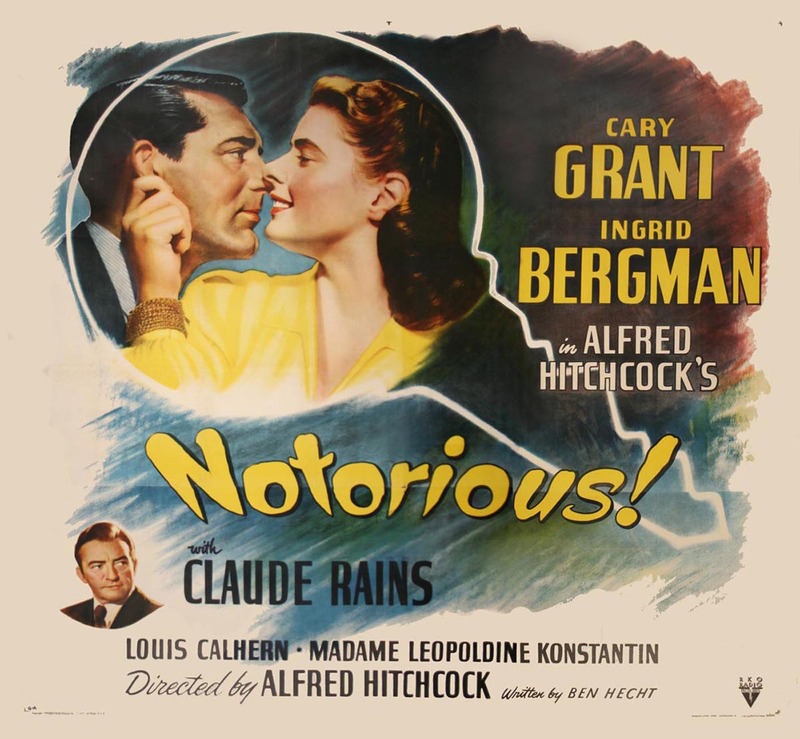 We will be screening Notorious (1946, Alfred Hitchcock, 98 mins). Notorious tells the story of Alicia Huberman (Ingrid Bergman) whose life is turned upside down after her father is convicted of spying for the Nazis. Alicia finds redemption, and romance, in her professional and personal relationship with Devlin (Cary Grant) – a US intelligence agent. A narrative of danger and suspense ensues as the pair tracks a Nazi mastermind. This film continues our recent focus on the Gothic. Like other gothic heroines (perhaps most notably the second Mrs deWinter-Joan Fontaine- in Hitchcock’s Rebecca), Bergman’s Alicia is a ‘woman-in peril’. Her role as a spy who deliberately seeks out dangerous situations complicates the issue, however. Fan Magazine writer Dorothy Kilgallen further commented on the ambiguity of her amateur spy character in a piece which selected the film as Modern Screen’s ‘Picture of the Month’ in November 1946. According to Kilgallen, Hitchcock ‘has flung the kohl-eyed Mata Hari type of adventuress into the cinematic dustbin and craftily built his melodrama around an apple-cheeked, soft-voiced, broad-shouldered clinging vine who looks as if she would rather play hockey than cops and robbers’ (p. 6). This signals Alicia’s vulnerable status in an unfamiliar world. This entry was posted in Screening and Discussion and tagged Alfred Hitchcock, Cary Grant, Dorothy Kilgallen, Fan Magazines, Ingrid Bergman, Modern Screen, Notorious (1946), Screening and Discussion, The Gothic by melodramaresearchgroup. Bookmark the permalink.